Election day in the US is on the Tuesday directly after the first Monday in November. Seems arbitrary, doesn’t it? The United States used to be an agrarian society, so the reasons for choosing the national election day seem outdated and strange now. Why was November chosen? Farmers whose livelihoods depended on harvesting crops and whose transportation depended on unpaved roads had to choose the election date very carefully. By November, the harvest would be over, yet harsh winter weather wouldn’t have arrived yet. Why Tuesday, and not any other day of the week? It often took a whole day to ride in a carriage to go vote, so the date was chosen so that it didn’t interfere with the Sabbath or market day. Due the electoral college law of the time, it had to be the Tuesday after the first Monday so that there were always precisely 29 days for electors to meet at their state capitols and vote by the first Wednesday of December. General elections for President and Vice President are held every four years for their four year terms, while Congressional elections are held every two years. General elections where presidential candidates are not being voted on are often called midterms. Elections to the House of Representatives occur every two years, and they serve two year terms. Elections to the Senate occur every two years for one third of the Senate’s seats at a time, and they serve 6 year terms. Now that the US is no longer an agrarian society, it doesn’t make much sense for the election day to be on a Tuesday, when most people are working. Many people want the election day to be changed or to become a national holiday so there will be better voter turnout. This sentiment has led to a proposal for making election day a federal holiday called Democracy Day. While the proposal from 2005 failed, its goal was increase voter turnout by allowing more awareness, more polling stations, and more time for people to vote. The bill was reintroduced in 2014 by Senator Bernie Sanders, but no action has been taken on the proposed bill. For voters who are unable to get to the polls on election day, they can try to make use of early voting and postal voting if their states allow it. Early voting is allowed in 32 states (and DC). Voting by post is allowed in 27 states (and DC) unconditionally, and also allowed in 21 other states with a valid reason. Oregon and Washington state even require voting by post. In other countries, elections aren’t necessarily held on a Tuesday. 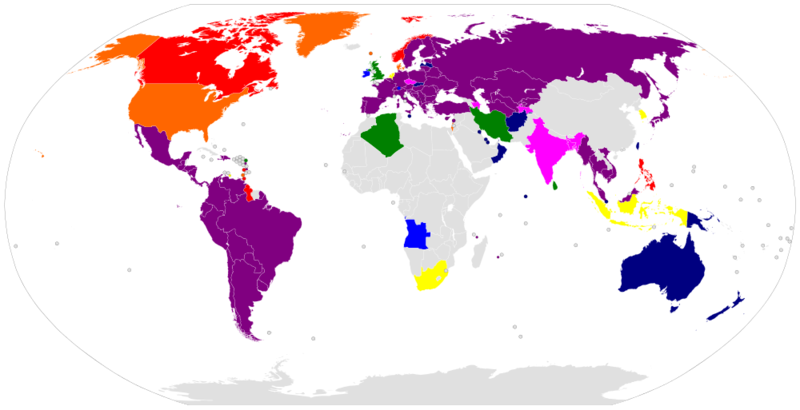 In fact, a larger number of countries hold their elections on Sunday to enable more people to participate. In cases where elections are held on a weekday, some countries make it a holiday. 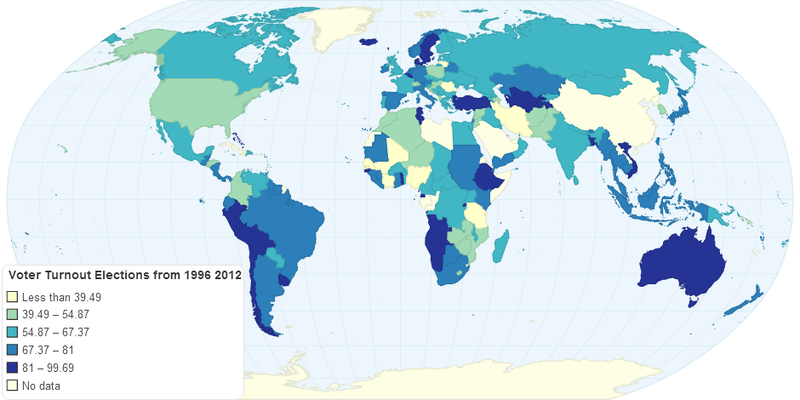 The following map shows each country’s election day by the days of the Week. 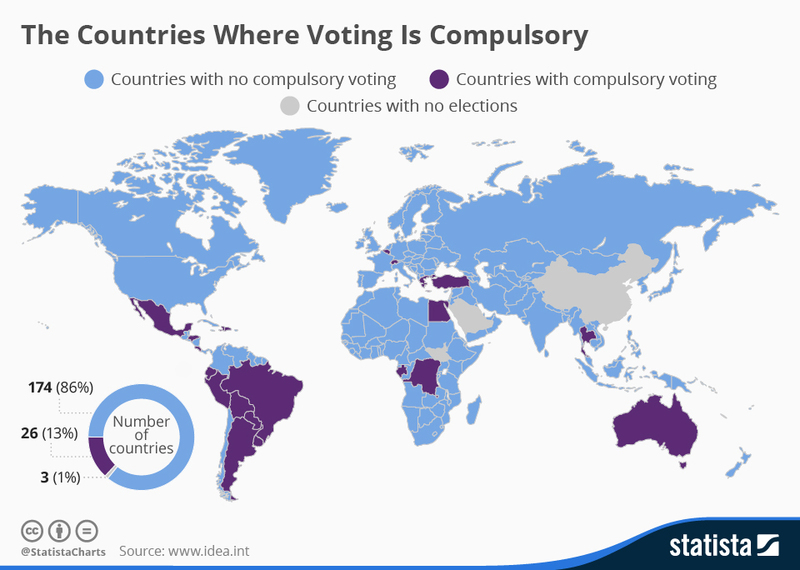 It is clear in this map of voter turnout that areas with compulsory voting are effective in increasing the proportion of votes, and countries with elections on Sundays also tend to have better turnout. It seems obvious that changing the election day to Sunday, making election day a holiday, or making voting compulsory would increase voter turnout in the US. Do we really want everyone to vote? “The best argument against democracy is a five minute conversation with the average voter” This is a quote from Winston Churchill, the famed Prime Minister of Great Britain during World War II. This is certainly a pessimistic view of democracy, but it rings true that a large part of the population is either uninformed or ill-informed. However, to credit Churchill, he also said “It has been said that democracy is the worst form of government except all the others that have been tried.” While democracy is imperfect, it is by far the best form of government that we have. The point of democracy is compromise. This means that since not everyone agrees with your viewpoint, what you think is best will not happen. Remember that what ends up becoming law is rarely perfect, but it is progress for everyone. Sometimes it may be a bitter pill to swallow, but it is the result of a democratic system, and democracy is the best we’ve got.